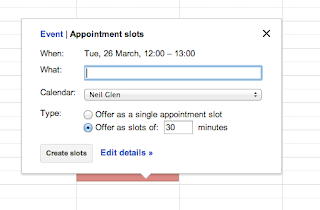 Appointments Google Calendars: Your Bath Spa University Google account is a service called Google Apps for Education, this offers more features than a regular Gmail account. 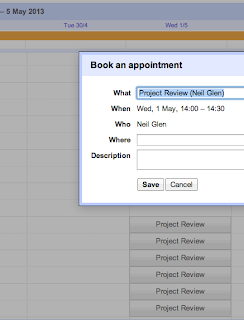 One useful feature is the ability to schedule appointment slots to make yourself available for tutorials. To do this select the time during which you wish to be available for tutorials in your Google calendar. In the window which pops up you will see top left the word Event and next to this Appointment Slots, click on Appointment Slots and you can edit the duration of each appointment slot in the time you have selected, for example 15 minute intervals. Click edit details, and you will be taken to a more comprehensive editing window. This window will display a link to the appointment page which you can share with students, you can email this to them or paste the link into Minerva. If you click on the link from this window it will appear that the appointments are not available, this is because the appointment page is not available until you have finished editing the details and clicked save. Students can sign up for appointments by clicking on the link and selecting an available time. Students will not have access to your calendar and will not be able to see details of any of your other appointments. Should a students decide they cannot make an appointment slot they can remove this from their calendar which will automatically free up the appointment slot for another student. 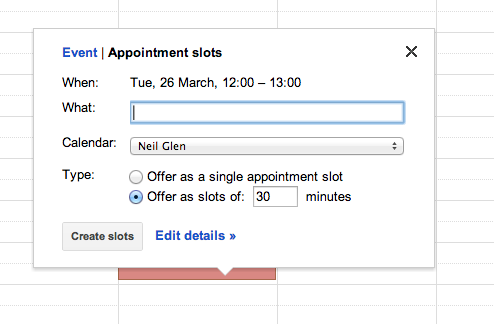 Note: You may have heard that the appointment slots feature was to be discontinued by Google. This is only the case for a regular Gmail account, Google have confirmed that Appointment Slots will remain available for Google apps for education users.